Travis CI allows you to automate the test, build and publish of npm packages or any other type of project. The great thing about Travis CI is that it’s FREE to use for open source projects. By setting up a Travis CI pipeline you can perform automated tests before the actual release which helps with the quality of the package. Once setup, everything can be automated, from testing to building and publishing. You only need to write code and push it to a git repository. GitHub repository needs to be public if you want to use Travis CI for free. You need a public git repository which contains the source code of your project. We are going to use that generated token and set it as environment variable inside the Travis dashboard. 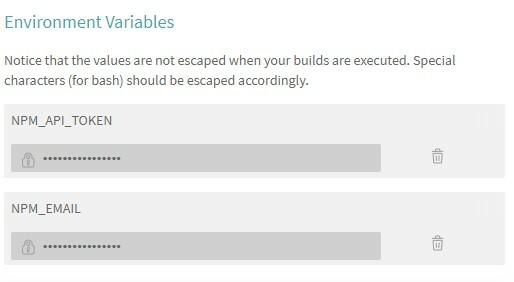 Go to the settings of your project inside Travis and search for the environment variables section. 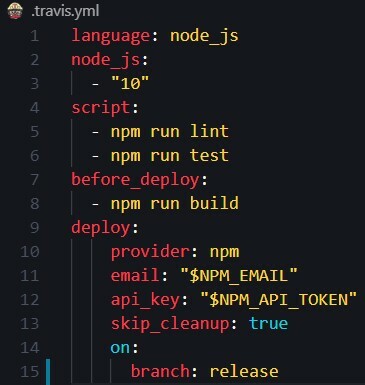 By setting the NPM_API_TOKEN and NPM_EMAIL we can allow Travis to publish packages on your behalf. In the root of your project you need a file called .travis.yml. This file defines the build and deploy process. Travis CI will automatically read that file on each commit. and 'NPM_EMAIL' with the correct values from the environment variables which we defined earlier in the Travis CI dashboard. 'before_deploy' will only run on commits to the release branch. In this case, the project will be build using npm run build. If the npm command fails, the deploy to npm will not happen. 'script' will always run on every commit. In this case, unit tests and linting will run. If one of those npm commands fails, the deploy to npm will not happen. By using the npm version command, npm will automatically create and commit a git tag for you. When you push your code to the release branch, Travis CI will automatically build, test and publish to npm for you! As you can see it’s pretty easy to get started with Travis CI and creating a pipeline for building, testing and publishing npm packages.